San Martín de Tours Church, also called “the Market’s San Martín” or “the Square’s” was built in the 13th century, on top of a previous construction at the Toresanos Neighborhood during the city’s resettlement, on the initiative of the Count Martin Fernández. This church has undergone many renovations and can hardly be seen among the modern buildings. It is, nevertheless, and after the Old Cathedral, the most important Romanesque building in the city. It was declared National Historic-Artistic Site in 1931. It has a basilical floor plan with three naves crowned by semicircular apses, invisible from the outside because of the nearby buildings, and there is neither transept nor dome. The Baroque works hid two of the three Romanesque portals. 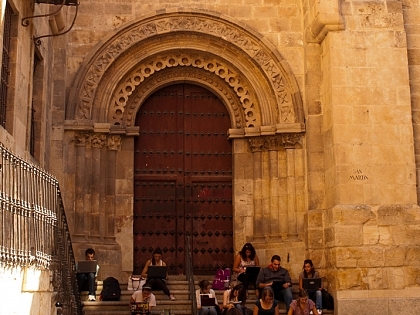 Only the northern portal has been preserved until the present and it is opened to the Plaza del Corrillo Square, called the Obispo Door. It presents excellent vegetal and figurative decoration. Its access is made through a staircase bridging the unevenness with the street. A polychrome sculpture crowns the set. It is the patron saint of the church, Saint Martin, on a horse tearing his cloak to share it with a beggar. The Puerta del Mediodía Door, at the southern side, is a Renaissance-style door built in the year of 1586 on the top of another primitive Romanesque portal. Originally there was one more door, the Puerta del Poniente Door, that was walled and reconverted into the Carmen’s Chapel and was rediscovered in 1958. Its original polychromy is conserved, being one of the most outstanding elements in the church. The church has suffered from structural problems from the beginning. In the 13th century several improvements and reinforcements were necessary because the vaults were pressuring and threatening the stability of the pillars, walls and roofs thus causing deformations. Moreover, some more incidents must be pointed out in the history of the building. 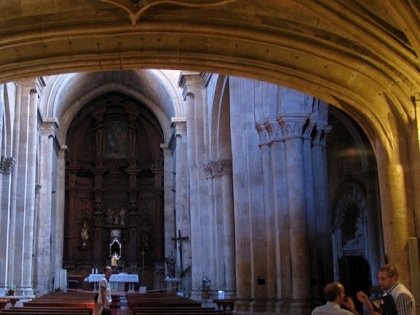 Some of the vaults of the central nave collapsed in the 18th century and there was a fire in 1854 that forced the rebuilding of the eastern sections and of the main altarpiece, attributed to the school of Gregorio Fernández, destroyed and substituted by another one by José Joaquín de Churriguera. A 16th century Elizabethan choir must be highlighted as one of its most outstanding elements. From Monday to Sunday: 11 a.m. to 2 p.m and 4 p.m. to 5 p.m.
- Easter, July and August: Every day, morning and afternoon. 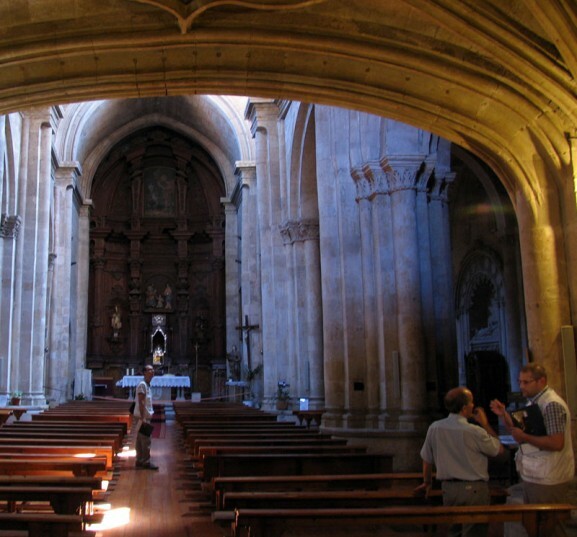 The first step of the Atlantic Romanesque works at the church of San Martín de Tours was to monitor the building by means of installing several types of wireless sensors which will remotely inform about the environmental and structural parameters of the church and therefore enable the observation of its preservation condition. The church’s structural problems have been a constant since its construction. These pathologies have mainly affected the vaults of the church central nave, originating the deformations which can be observed at the present time. A monitoring plan has been developed in order to know the real causes of the visible deterioration. Several temperature and humidity sensors have been distributed across the critical points of the structure to check the church condition. They will send data to a central server, enabling the detection of major changes or alterations. 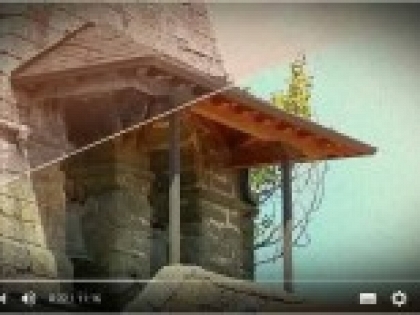 Simultaneously, static and dynamic structural movements of the building have been monitored by means of installing an accelerometer that detects possible external agents which provoke vibrations that present risks for the structure, and clinometers in the northern and southern walls registering inclination movements. The analyses joining all these variables, after a time of monitoring, will determine if the deterioration process is still active, as well as design the possible causes and solutions for the pathologies that have arisen since its origin or check if this damage is caused by previous correction actions, thus helping the development of future works or action projects. Several recent actions taken on the monument enabled the partial consolidation of its structure and external figurative elements, nevertheless on its inside no restoration actions had been carried out. The main target of the current action was to correct the problems of detachments and structural failures, particularly at the vaults, where defects in stone material in the first section of the Evangello’s Nave (above the so called Obispo Door) were produced, due to defective construction and the action of humidity. Efforts were concentrated on restoring this area as most of pathologies were found here. 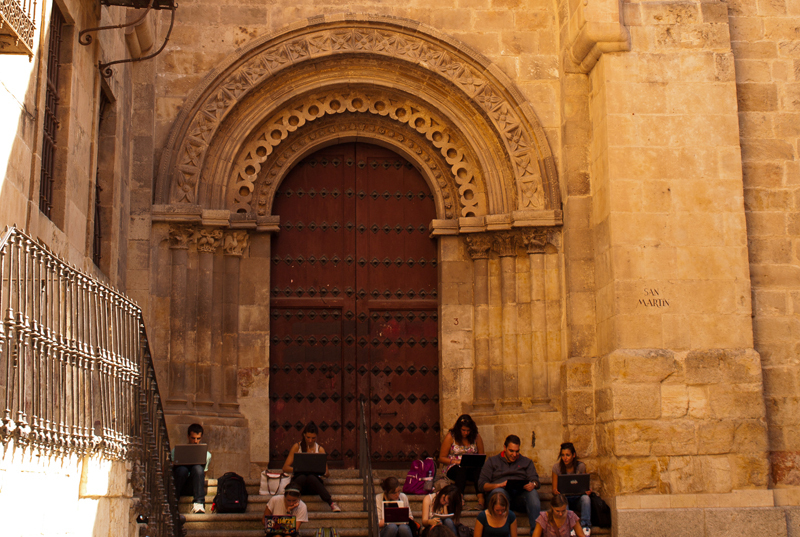 The works enabled regaining the access through the church’s northern door leading to the Plaza del Corrillo Square, next to the Plaza Mayor. 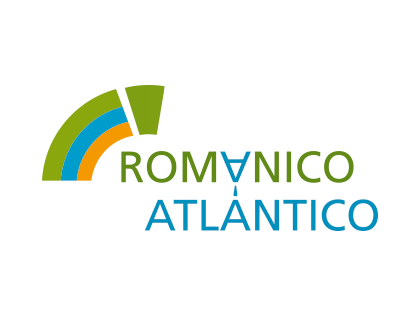 This door was closed because of the bad condition of its vault, but now it can be the access to the Information Point for the Atlantic Romanesque Plan and the visitors’ reception area. It was also possible to improve the access to the Carmen Chapel, where the old Romanesque portal conserving rich polychromy can be found. The actions were completed by illuminating the area in order to highlight the main ornamental and sculptural elements and monitoring the church as to track its preservation conditions. While the church’s restoration works were being undertaken, an exhibition area was refurbished in order to promote the aims of the Plan and to boost the interventions carried out both at San Martín’s and at the other churches included in this project. The area also includes information about the history of the church and its development, as well as information about the chapels contiguous to the northern access path. With the use of new technologies, through audiovisual resources and a lighting carefully focusing the main construction elements of the chamber and the old Romanesque portal, the visitor is led throughout an information itinerary which intends to transmit both the emotion and the spiritual value of the area where the visitor finds himself. The parish founded in the year of 1103 by the count Martín Fenandéz, leader of the repopulators of Toro, is dedicated to San Martín de Tours, one of the most popular saints of the time. It has been said of the church that it is a smaller scale reproduction of the Old Cathedral. It is, after it, the most important romanesque church in the city despite the alteration of its original fisionomy and the fact that it is now boxed between modern constructions. 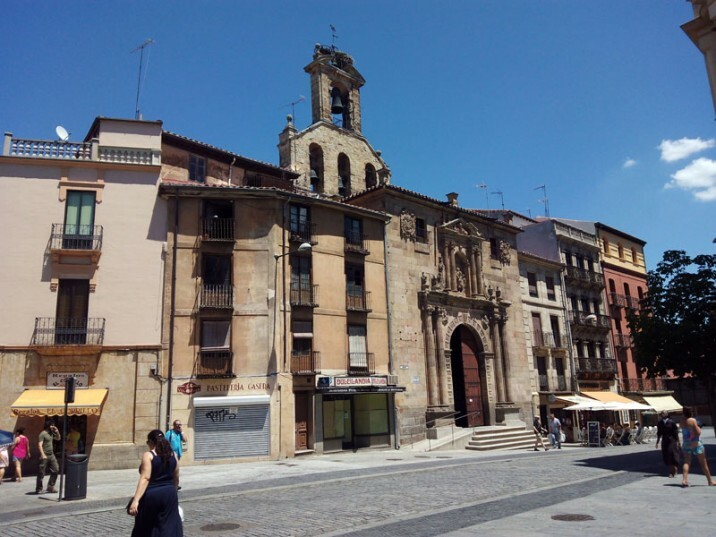 With the expansion of the walls and the dislocation of the people towards the north, the parish of San Martín was transformed in the neuralgic center of the city, know from the ending of the 12th century as San Martín del Mercado. In the 12th and 13th centuries, the population of Salamanca grew considerably and the lack of space in the older economic centers (Azogue Viejo and Puerta del Sol) dislocated the commercial activity to this square. The Casa Consistorial was relocated to the square and it was consolidated as a space of celebration of the cities most relevant social events. The church’s clock regulated the activity in the square. In it vegetables, grains, wine, fish, meat, coal and silverware were sold, as well as all sorts of products needed for the sustainability of the society of Salamanca. The varied functions of the square have caused its transformation, turning from the 15th century in the center of Salamanca’s first Plaza Mayor. In 1497, the prince Don Juan, son of the Catholic Monarchs and lord of the city of Salamanca, orders the construction of walls in the Plaza Mayor de San Martín, whose surface we know reached 26.000 square meters. Four times larger than the current location of the Plaza Mayor. It was considered by numerous travellers as the largest square existent in Spain and one of the largest in Europe. It has been said of the church that it is a smaller scale reproduction of the Old Cathedral.It must have been started around 1160, starting from de apses, as its initial structura was planned to have pointed barrel vaults on the main nave and groined vaults on the lateral ones. It shows a rectangular plan absent of transept, with three naves of four sections that end in three semicircular apses, invisible to the exterior because of the attached buildings. Around the 13th century certain parts began to fall, so the vaults and walls of the feet that are visibly inclined had to be strengthened . On the 18th century the heavy weight of the vaults caused the majority of the central nave to sink down. Jerónimo García de Quiñones was responsible for replacing them by new ones with plaster bricks to lighten the weight, which allow for the opening of the windows that lighten the nave. Currently, the medieval testimonies of San Martín are completely masked by later reforms and by the modern constructions around it. The baroque works have hidden two of the three romanesque entries. Only one is still opened to the town center (towards Plaza del Corrillo), the north entry. 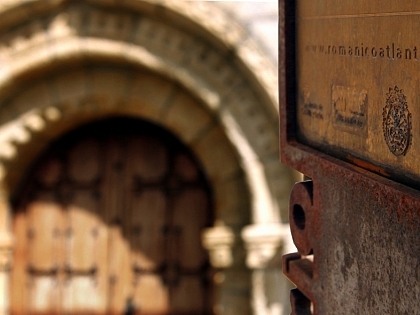 The curious forms of the archivolt are clearly influenced by the Puerta del Obispo of the Zamora cathedral. Above it there is a relief of San Martín riding the horse and sharing his coat with the poor of Amiens. The occidental entry, located at the end of the main nave, has been concealed from the ending of the 17th century because of the construction of the chapel of Carmen. 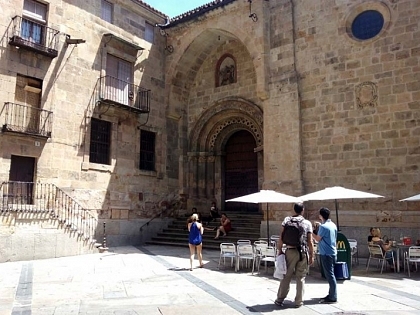 The south entry, which opened to the street of la Rúa was covered with a renaissance porch. At the end of the church one can find the high choir and the access stairway, that were a construction by the architect Juan de Álava in 1516. Inside the church the amount of tombs preserved is quite interesting, and these are dated from the middle of the 15th century and the beginning of the 16th century. In 1854 a fire destroyed the wonder main altarpiece that had been designed by Juan Gómez de Mora in 1621. To replace the one from the lost monastery of San Pedro de la Paz, dated from 1735, was brought in. This dependence was financed by the fabric commercial, Juan Muñoz del Castillo and his wife, María Cruz Guerra. They were stewards of the church, founding in 1686 the foundation of la Música de San Martín (The Music of San Martín), which allowed the church to have its own musicians. The construction was carried out by José Benito de Churriguera, between 1695 and 1698, projected in accordance with a central plan, close to that of the greek cross. The chapel closes itself with a dome over pendentives and lantern, and in the lateral arms with a barrel vault with lunettes, that allowed for the opening of two small windows and the presentation of the portraits of the patrons. The dome is decorated with symbols of the Passion, in accordance with the chapel’s first dedication. Nuestra Señora de las Angustias’ image, now lost, would preside the main altarpiece of the room. Behind this one, a small room was built, as a dressing room, in which a small window was opened as to light up the image. Currently a sculpture of the Virgen del Carmen is presiding the room. The lateral altars hold images of Santa Lucía (northern wall) sided by images of San Francisco and San Antonio and Santa Ana (southern wall) with a painting over it of San Joaquín and relieves on the sides of the Santos Juanes (Bautista and Evangelista). The founders expressed in 1699 their intention to found within it the festivities of the Cuarenta Horas (Forty Hours) in the three days of the “carnestolendas”, with a sung service, sermon in the afternoon and music in the church. From the inside of this chapel one can contemplate the archivolt of the primitive romanesque door that has remained concealed after the construction of the baroque space and preserves most of its polychrome. It is made of six semicircular archivolts, profusely adorned with flowers, small horseshoe arch, vegetable motives and representations of the months of the year. The Chapel of Conde Grajal, dated from 1413 hold the remains of D. Juan de Villafuertes, who had his house-tower in the old San Martín square, now Plaza Mayor, rebuilt in 1784 by his descendant Manuel Pérez Ososrio. The altarpiece is dedicated to the african martyrs, supposedly born in Salamanca Arcadio, Provo, Pascario, Eutiquio and the Pauline child. In 1765 the cult to these martyrs was approved, when D. Gabriel de Esparza was the bishop. The sculptor of the martyrs may have been Pedro López Reinaldos, brother in law of the assembler of the altarpiece.